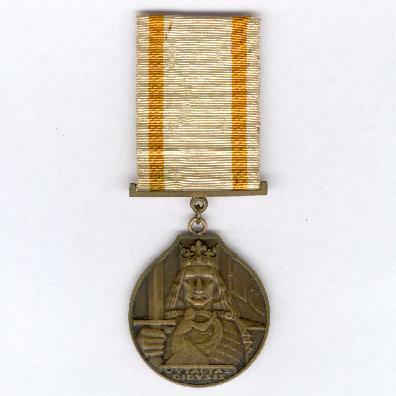 Circular bronze medal flattened at the top with loop and bar for ribbon suspension; the face with a full-face head and shoulders portrait of Grand Duke Vytautas the Great, an upright sword in his right hand, a standard bearing the Cross of Vytis to the right, a kneeling female figure in the foreground offering a laurel wreath, inscribed below ‘VYTAUTAS DIDYSIS’ (Vytautas the Great), signed ‘TARABILDA DEL’ for the Lithuanian artist Petras Tarabilda (1905-1978); the reverse with the crowned shield of Vytis, being a knight on horseback, imposed a horizontal band decorated with oak leaves and dated ‘1430 1930’ below, signed ‘Huguenin Sc’; on original ribbon. 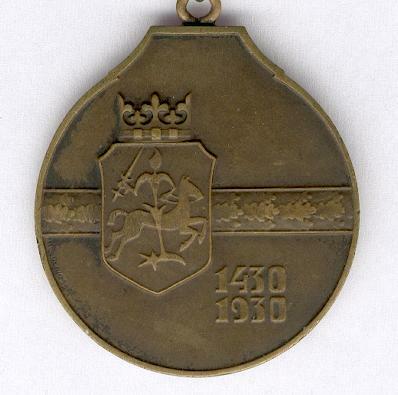 The Order was instituted in 1930 to mark the 500th anniversary of the death of Vytautas the Great and the medal was intended to reward ten years loyal service to the Lithuanian state. 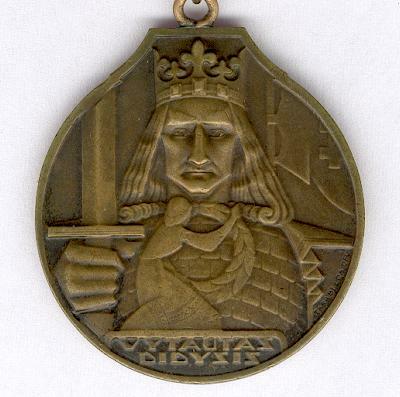 Vytautas the Great (1350-1430) was Grand Duke of Lithuania from 1392 until his death in 1430 and ruled over lands from the Baltic to the Black Sea, making his the largest realm in Europe at that time. He was the victor of the Battle of Tannenberg in 1410 which effectively ended the expansion of the lands of the Teutonic knights and became an important icon in the national reawakening of Lithuania in the early 20th Century. 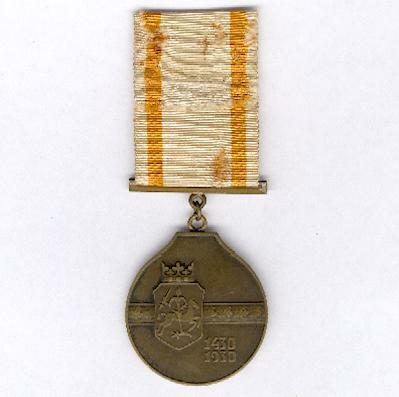 The medal was manufactured by Huguenin Frères of Le Locle, Switzerland and suppressed in 1940 at the time of Soviet invasion. The number of medals awarded is a matter of debate, with authoritative published figures ranging from 1,990 to 2,127. In any event the number was small and this and Soviet and German invasion and occupation make the medal very hard to find.